Bill Fen Marina is located on the Middle Level Navigations close to the unspoiled market town of Ramsey. The Marina is situated on a beautifully landscaped thirty one acre site amidst open farmland. Substantial planting of over 2000 trees has created a new wood as part of the Marina site, adding to the beauty of the existing mature trees. A 10 acre extension to the marina grounds is in progress and will provide another beautifully landscaped pond. On site surveillance is provided by infrared cctv cameras and for added security, the owners live on site. The proprietors, John and Lyn Shotbolt, have created an idyllic setting in this tranquil location, come and visit, see for yourself. Having a marina in the Middle Level may seem a remote location to most of the inland boating population but John and Lyn Shotbolt have taken remoteness a stage further by establishing their marina at Bill Fen on Ramsey High Lode. It is 7? miles from the so called “through route” used by craft crossing the Middle Level navigations between the rivers Nene and Great Ouse. Nearly 150 boats now have places in the marina and others are on the waiting list for moorings. The Middle Level is one of the few places where boats do not require a licence to cruise (although this is likely to change within the next few years) and that is one factor in the increasing demand for moorings in the area. There are also a large number of people living in East Anglia that want to cruise the waterway system but would like to keep their boats near home. Nor is that the whole story as a closer look at the marina will reveal. In about 1947 John Shotbolt’s father and grandfather started an engineering business in Ramsey doing agricultural work and acting as sub-contractors to large local engineering companies. John continued the business and was living in a house by the Old Nene river at Ramsey St. Mary’s when he decided he would like a boat, so he built himself first a small flat bottomed boat and then a narrowboat. He then got requests from people to build narrowboats for them and by the time he stopped boat building in 1997 he had completed 60 craft. Having bought a boat many people were then asking where can we moor? This prompted John and Lyn to look for a suitable site for a marina in the Ramsey area. Their first idea was to use a plot of land near their home village of Ramsey St. Mary’s but this was turned down. In response to their enquiries the planners suggested that an acceptable place to build a marina would be somewhere down the Ramsey High Lode, that runs from the Old Nene to the town. Some land in this area came up for sale by tender and they were able to buy the site. In 1991 the site was just a flat field with no trees, shrubs or water features. An application for planning permission was made and granted and the first stage of the marina, providing moorings for about 30 boats, was dug out in 1992. Two further stages of development followed with an extra plot being bought to complete the last stage which provides moorings for between 140 and 150 boats. The small size of the original moorings was because at this time John was constructing boats at a site in Ramsey and the Bill Fen moorings were just a sideline. Now they have ended narrowboat building and the marina is the main activity of the business. Lyn does all the administration and paperwork while John concentrates on maintaining the site which has a large area of grass and shrubs. The usual diesel, water, gas, coal, pumpout, toilet and showers are available and there is a small chandlery that can supply boater’s needs either from stock or by ordering in. It has no formal opening hours as it is mainly a service for moorers. There is a slipway that will take boats of up to 60 foot. DIY boat blacking and painting can be done but there is no covered boat painting area. 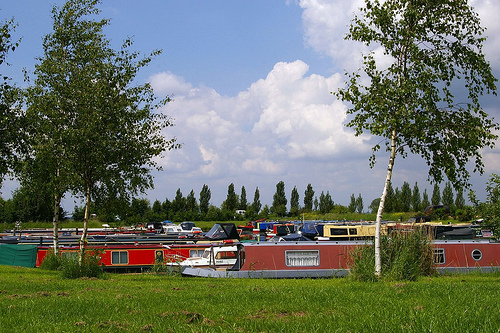 The marina is also a Caravan Club Certified Location with five plots located in a sheltered position beside a large pond that has been created as one of the many landscape features on the site. Fishing is good in the marina and attracts a few local anglers. Once a year the marina hosts an event for the local IWA branch which usually takes the form of a boule and barbecue day but which this year also includes a May Bank Holiday weekend gathering for moorers and visitors. This is just another factor that contributes to the friendly and welcoming feel of this marina in a rural setting close to the small town of Ramsey. Once out of the marina there are miles of quiet fenland waters with few locks that recapture the solitude and peaceful cruising that are now just a memory on many of our waterways.